Showing your team spirit while supporting a favorite charity - that's a winning combination! The Detroit Metro Airport Marriott did just that right off the bat on the Detroit Tigers Opening Day earlier this month. 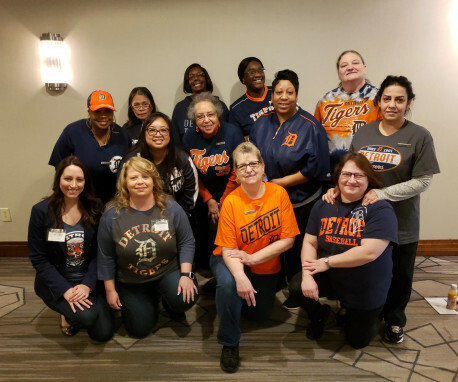 Associates were encouraged to make a small donation and wear Detroit Tigers gear with all proceeds benefiting Give Kids The World. "We have a large base of team members who are into Detroit sports, especially baseball and not everyone has the opportunity to go downtown to the opening game to celebrate," said Brandi Simmons, GM of the Marriott. "So we thought it would be fun to bring a little bit of opening day excitement to the hotel." When asked why she feels it is important to step up to the plate and raise funds for Give Kids The World Brandi adds, "We feel it brings togetherness to the hotel and it helps promote teamwork among the team members." The Marriott participates in many fundraisers for Give Kids The World. Along with volunteer employee payroll deductions, many associates also participate in weekly Jeans Days and Detroit Lions Jersey day for Detroit Lions games. Their commitment to Give Kids The World is seen throughout the hotel with colorful donation boxes at the front desk and in the Concierge Lounge. It's an opportunity to touch base with associates and guests about the importance of helping families of critically ill children. "We believe it gives the associates the opportunity to understand what Give Kids The World is. There are some employees who do not have the $5.00 to donate on Fridays so this gives them the opportunity to donate," says Brandi. Opening Day was certainly a success and not only for the Tigers' win. When it comes to team spirit and a commitment to Give Kids The World, the Detroit Metro Airport Marriott hit it out of the park!